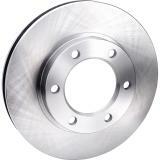 Many vehicle owners with original factory rotors experience vibrations and corrosion problems. 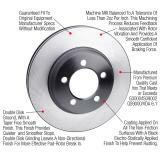 Brake Performance Premium Brake Rotors solves these issues by machine balancing each rotor for high speed operation and applying a special e-coating to resist 400 hours of direct salt water exposure. Brake Performance also includes a lifetime warranty against materials and workmanship defects and one year for warping and cracking. Rotors are machine-balanced, surface-ground double-disk smoothed. 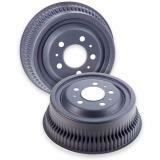 Manufactured from premium quality cast iron that meets or exceeds G3000/ISO9002, QS9000/VDA 6.1 specifications. Precision-machined to exact original equipment manufacturer dimensions and specifications. Includes a free black electrostatically applied rust preventative coating on all non-friction surfaces capable of withstanding 400 hours of salt water exposure. Premium Replacement brake rotors are backed by a Lifetime Warranty against defects in materials and workmanship and a 1-year unlimited-mile warranty against Warping and Cracking. 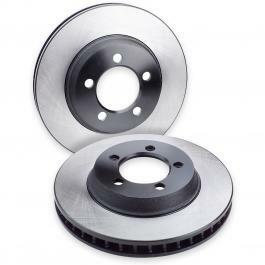 The Premium Replacement Brake Rotors include a proprietary black electrostatically-applied rust-preventative coating on all of the rotorï¿½s non-friction surfaces, ideal for vehicles that have brake rotor rusting issues. 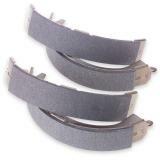 These brake rotors are machine-balanced to a tolerance of less than 2oz per inch. This machining process reduces feedback associated with rotor vibration and provides a smooth, confident application of braking force. 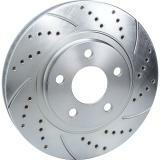 All premium brake rotors are x-ray inspected and machined with a double-disk-ground taper-free smooth finish, providing quieter and smoother stops. 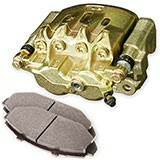 Double-disc grinding leaves a non-directional finish for more effective pad-to-rotor break-in, extending the life of the brake pads. Our rotors are manufactured from premium-quality cast iron and guaranteed to fit original equipment manufacturer specs without modification. 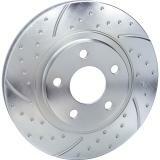 Our premium brake rotors include a lifetime warranty against defects in materials and workmanship, and one year against warping and cracking. 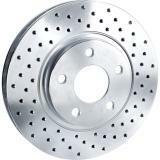 Brake Performance Premium Replacement Brake Rotors are machined to the same fit and dimensions as your factory brake rotors. 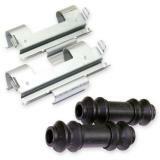 You can install them with no worries about factory fit or function. We recommend that you have a certified mechanic install them for proper break-in procedure. 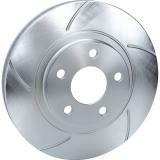 If you have any questions or need assistance choosing the correct brake rotor for your vehicle, call our brake experts toll-free at 866-756-5536. We include detailed installation instructions and break-in procedures with every kit. 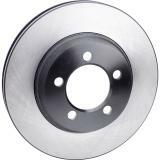 Premium Replacement Brake Rotors are ideal for all domestic and foreign light, medium and heavy-duty Cars, Trucks and SUVs. See our comparison chart for application advantages between the different types of rotors. Photo Disclaimer - The Product Photo is for display purposes only. Actual product may vary in size and bolt pattern. After you select your vehicle, click on the part number to see the actual dimensions.